We’re not the types who keep the Weber burning all year long — something just doesn’t feel right to me about grilling a leg of lamb while wearing a parka. Which means that this past Saturday night, when the sun was on its way down before the girls’ muddy cleats had been kicked off, may have just marked our final grilled fish dinner of the season. But it was a good one. In a small bowl, whisk together 4 tablespoons soy sauce, 2 teaspoons finely minced fresh ginger, 2 teaspoons dark sesame oil, and a bunch of freshly ground black pepper. 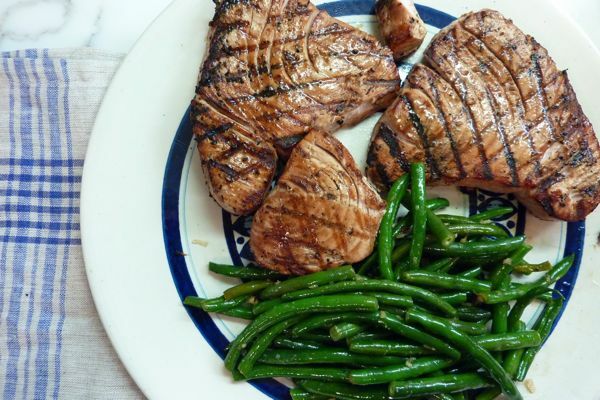 Place 1 1/4 pounds yellowfin tuna on a large dinner plate and pour soy marinade on top. Marinate about 15 minutes. Five minutes before you grill, squeeze a big wedge of lime over fish, flipping to fully coat. Grill over medium-hot coals for 3 minutes a side (rare) or 4-5 minutes a side if you like it more well done. Add a couple handfuls of green beans (about 2 cups or what’s shown above) to boiling water that has been salted. Cook 2 minutes then immediately plunge into a bowl of ice water to stop the cooking and preserve the beans’ bright green color. After a minute, drain and pat dry with a paper towel. In a medium skillet set over medium heat, add a tablespoon of vegetable oil with a drop or two of sesame oil. Add 1 tablespoon minced fresh ginger, 1 large garlic clove (minced), and cook 1 minute. Add beans, a little kosher salt, and toss everything until beans are coated. Raise heat a bit and stir in a teaspoon of rice wine vinegar and a teaspoon and a half soy sauce. Cook another minute then serve. This looks delicious — but I’m mostly glad that you linked too the Monterey Seafood Watch List. The sustainability of tuna and of all our seafood which is being rapidly depleted from our ocean is no joke and everyone should be informed about their choices before buying. Doug – That made me laugh. I think it must be a LOT colder over in these parts — it’s at least a mile north of you. Or…south. OK, we have no excuse. I love the addition of ginger to the beans. I get stuck in a rut of using garlic with mine, so this is great. My husband is one to stand in a Chicago blizzard and grill. I on the other hand would be perfectly fine with putting it away the second the leaves change! This meal looks delicious.